Separate orders by division – With this option set, a user only sees the orders from their own division. Match lowest price in price matrix – The lowest price will get selected even if the customer’s specific price is higher. Use customer’s default warehouse – If this is selected, the warehouse that is set for a customer will get used on a sales order instead of the one in inventory. Use cost from inventory for non-physical items – If selected, the cost will come from inventory. If it’s not selected, the cost will be zero but allow the user to edit it on the sales order line. !Use caution with cost on non physical items. Be sure that the sales dept used does not credit the inventory GL account, unless the user makes sure that a corresponding AP entry gets debited to the inventory asset account. 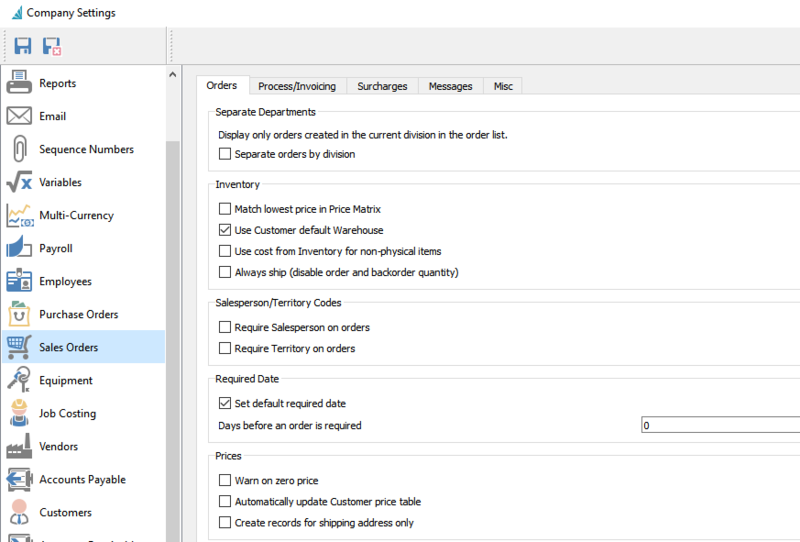 Always ship (disable order and back order quantity) – Inventory levels will not be used to decide what to ship. In this case, everything will ship and there will be no back orders kept. Require salesperson on orders – Order will not be able to be saved without a salesperson. Require territory on orders – Order will not be able to be saved without a territory. Set default required date – Set a required date on the sales order. Days before an order is required – Number of days ahead the default required date (above) will be set to. Warn on zero price – Warn user if an item is added to an order without a price. Automatically update customer price table – If set, every item and its price on a sales order will be added to the customer’s price list. !BE CAREFUL because if you sell to the customer at a onetime low or zero price, it will remember it. Create records for shipping addresses only – Prices will be set for the shipping address of the sales order instead of the billing address.